Ah, filet mignon. The most delicious, melt in your mouth, five-star cut of steak you can find on the butcher's shelf. The only issue? The price point. Every now and then you can treat yourself to this elitist piece of meat, but it turns out you don't always have to spend that much. There are plenty of ways to achieve that juicy delectable taste of filet mignon while spending only a fraction of the price. With these 12 tasty secrets, you'll make your stomach happy and give your wallet a break. This is the best-kept secret for ensuring you get a juicy, tender, piece of meat. Heavily salt the slab of meat a couple of hours before cooking and let it sit. The salt will break down the muscle fibers to provide maximum tenderness. Rinse off the steak prior to cooking so you don't oversalt your meal. Stewing meat at a low temperature for an extended period of time will allow it to soak up all of the juices in the pot and give it a tender bite. If budget is on your mind, stews are also a cost-effective option to make a little bit of meat go a long way. Adding liquid to the cooking process helps keep meat juicy and delicious. Although braising adds tenderness when browning the meat, it also adds a lot of flavor to the dish. Try braising a roast with red wine, broth or milk and it will fall right off the bone. It's not just about what cut of meat you purchase but how you slice it that can affect taste. Slicing against the grain means cutting through the muscle fibers to shorten them as opposed to cutting in the same direction they run. This makes bites much easier to chew and ultimately more tender. Avoiding this trick will leave you with a much chewier, tough munch. If you want steak to cook perfectly even, it's important that the meat is brought to room temperature, around 70 degrees, before you get it sizzling in the pan. This is especially important for thicker cuts because it can take some time for the middle to get to an even temperature. If meat is extra tough and lacking flavor, marinade will save the day. Not only will it infuse flavor but it will also tenderize the meat. Toss together a mixture of something acidic such as lemon, vinegar or yogurt, add in favorite seasonings and let the meat marinate for a couple of hours. Ginger is a wonderful addition to dozens of marinades and not just for its bold flavor. Ginger is a powerful source of proteolytic enzymes, which help to break down any protein, ultimately making a piece of meat more tender. Scoring only takes a couple of minutes but can make all the difference. 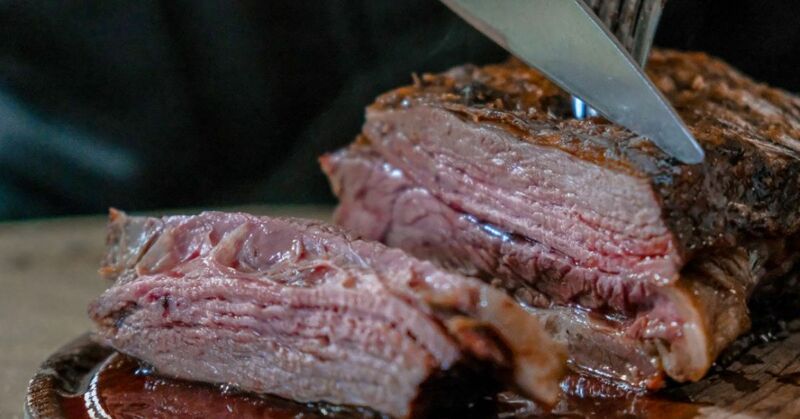 If the cut of meat has a thick layer of fat, scoring it will he help release some of the fat as it cooks, which will result in a juicier, succulent taste. Letting meat rest and cool down after removing it from the skillet is a simple task that is often overlooked. If you cut meat before it's rested, the juice will seep out onto your plate before it's absorbed into the meat. Many fruits contain protease, an enzyme that actively breaks down meat proteins, making it a sensible addition to marinades or sauces to douse a steak in. Some fruits that are packed with protease are kiwi, pineapple, papaya and fig. If you’re not in a time crunch, dry-aging meat is an excellent way to break down muscle fiber and lead to a mouth-watering plate. All you need for this technique is cheesecloth and a refrigerator. The process takes from three to seven days. The act of dry-aging gives the meat time to naturally break down muscle tissue, which drastically improves the texture and taste. You've probably heard of a coffee marinade, but tea is a unspoken gem. The tannins of a strongly brewed black tea help tenderize meat and add an earthly flavor.